Also, after a little research, I also found out that Gucci Mane has a reality TV show and lots of lots of fans, including a new fan, Jacqueline Stallworth. Yep, I’m a fan. I was not reading this book, just like with most of the books that I read, to disagree or agree, but to get an understanding, develop a little more empathy, and to enjoy. AND, with this book, I did all three. Gucci Mane may have been born with a gift for rapping, but he had to work to cultivate that skill. Gucci Mane worked on his voice, studied rap, and practiced. Overtime and with lots of work, he became Gucci Mane the rapper and created music that folks love. Now, doesn’t that sounds like most of us? We have to work at things in order to get better and maybe even good. I hope that when the youth read this book, and they are reading it, they understand that we have to put in work to achieve dreams. This man was writing music relentlessly while in prison... and produced projects as soon as he was released that received a lot of praise. Stories matter... Whether or not I like what he says in his rap, he is rapping his reality and the reality of folks similar to him. I think that many of us love stories that we can relate to, and we have respect for folks who courageously tell their stories, because it gives us courage to tell ours. So, Gucci Mane’s story matters, and him telling his story may be helping a whole bunch of folks, and maybe giving folks courage to speak their truth. Under stress, many of us go back to what we are familiar and comfortable with, and it seems like what we go back to are things that are not good for us: folks, food, drink.... and a whole bunch of other stuff that is within our comfort zone. I want Gucci Mane to know, “Brother, you are not alone." Hard work pays off... PERIOD! I totally respect the fact that Gucci Mane did not just “talk the talk but he walked the walked.” He was not writing one thing and doing something else. At the end of the day, “To thine Own self be True.” I can’t tell my students that reading is important, and I not take the time to read. Folks are watching... “Walk the Walk." What if we could be free of other folks' thoughts or what we believe they are thinking, and live our lives? I truly believe that the amount of discipline that a person has, has a lot to do with his/her success.... AND, reading saves lives, reading changes lives, WORDS matter! Not much I can say after that.... Gucci Mane basically summed it up! I'm going to have to put this book, on my reading list. 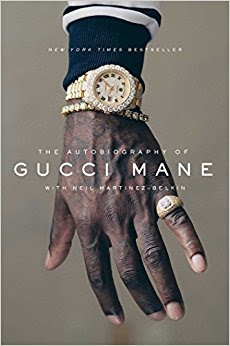 I never knew Gucci Mane biography.